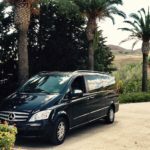 Driver in Sicily provides a high quality car service with a fleet of vehicles to suit any budget and seating requirements: cheap taxi, comfortable limousine, MPV minivan, van or minibus for groups. Thanks to the fare calculator, check our competitive quotes instantly and all Sicily airports connections by limo transfer, taxi ride, shuttle service, cruise transfer. There are no hidden costs: our fixed prices are quoted per car and all costs are included in the fares. By using our online booking service, you can be assured that our driver will be on time at pick-up meeting point. Take the stress out of your trip: book your transfer in advance to the destination of your choice ! Meeting you inside Airports terminals, Cruise Terminals And Stations with an iPad displaying your name or your company logo. Transfers to Milazzo for the Aeolian Islands and to Trapani or Marsala for Favignana Island or San Vito lo Capo beach. Our prices include Meet & Greet service at the airports with a name board sign bearing your name. Your driver will be waiting for you inside the airport at your arrival terminal. The map of your gate or arrival terminal with the exact meeting point with your driver is sent to you with the receipt of your booking. In the same way, your assigned driver will easily meet you at the Debarkation pier of your ship at Palermo port , or at the platform of your train at the station. Our aim is to make your bookings as simple as possible. Whether you have booked online, by email or over the phone, we always send you confirmation. If your flight delays, due to bad weather (for example), or is in advance we always consider the actual landing time of your flight. You may pay by cash to the driver at the end of each trip. Airport transfers to/from hotels, cruise transfer to ports and door-to-door taxi rides. Private tours of Sicily . Shore excursions from Palermo port, Messina port, Giardini Naxos port.